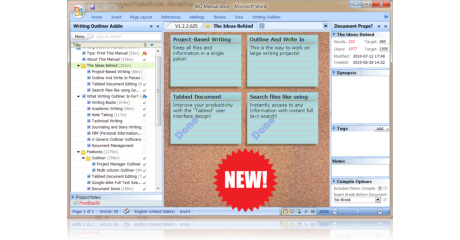 Write your next novel, non-fiction book, manual or academic document in MS Word with great ease! 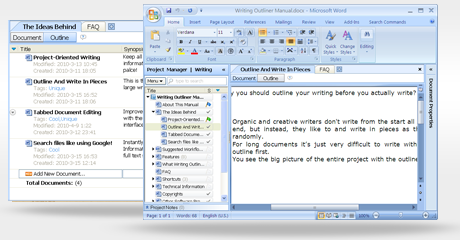 Writing Outliner is a Word add-in for creative and professional writers who work on large or complex writing projects. It lets you manage and edit each part of a long text as a separate document, and then merge them into one. Left: Project documents organized as a hierarchical outline. 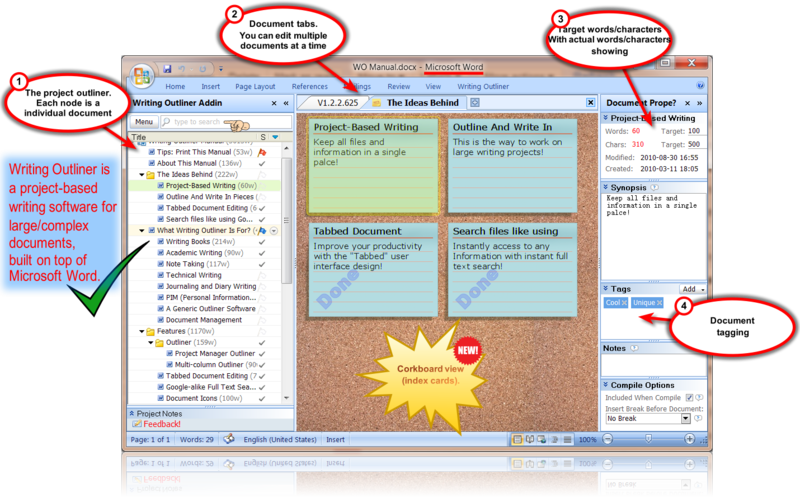 Middle: The original Word document window that loads the selected document of the left outline. Right: Document metadata: synopsis, tags, notes, etc. It's built on top of Microsoft Word! With MS Word's industry-leading word processing power + Writing Outliner's full-featured outliner, tabbed editing, full-text search, document tagging, version control, Corkboard (index cards) , etc, you have all functions you creative and professional writers need for writing book-length complex documents! And you don't have to learn another new writing software! An indispensable writing tool for Word! Writing Outliner provides so much of what a writer who knows what (s)he is doing needs: The flexibility of organization of longer text, focusing on fragments (with summaries, tags, notes), their overview, rearrangement and revising, all in one place. New corkboard (index card) view! It's $49 only now! See what real-life users say about this creative and professional writing software.